Hanna Schygulla, the German film star, applying her makeup for a scene in Berlin Alexanderplatz, Munich, 1980. Photo by Alfred Eisenstaedt. Don’t forget to like us on Facebook, you know where, for more photos. I am not the author of this image. Many actors do indeed surface more and more each day, however, I don’t think it’s a particularly difficult task to pick up on someone’s talent. Good performances in cinema are like wine: You may not be an expert on it, but if it’s bad…YOU’LL KNOW! 1- His works with Danish director Ole Christian Madsen will give you an insight as to contemporary Danish cinema through “Nordkraft”(2005) & “Flame & Citron”(2008). 2- Despite of his talent, he didn’t sell out to the Hollywood money-making machine (yet) and the only American film he starred in briefly was “Into the Wild” (2007). 3- He is capable of changing his looks dramatically from one role to another & the shift is brilliant on screen. Take the photo below for example. 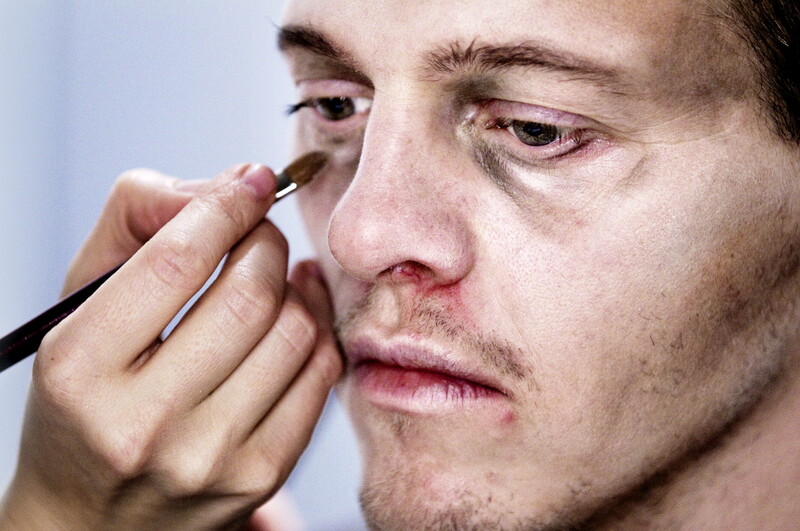 In this shot, Lindhart gets his make-up done for “Nordkraft”, in which he painfully plays a junkie. He lost around 19 lbs for that role and delivered the character with great intensity. Oh and by the way, it is actually the very first film to be shot in Christiania in Danemark, a town known for drug trafficking, just because the pushers wanted some “good publicity”. Oh, and the film also has a great soundtrack, The Raveonettes included with their “Beat City” ! NB- For another great Danish actor, check out these cool photos of Mads Mikkelsen, declaring his love for The Ramones here & a film in which Mikkelsen starred, directed by Ole Christian Madsen named “Prag” here. 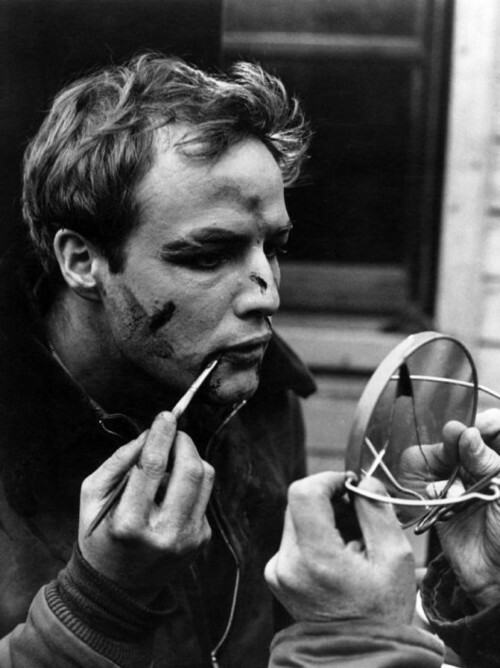 © An intimate shot of Marlon Brando putting his own make-up on on the set of Elia Kazan‘s redeeming film “On The Waterfront”, back in 1954.It has been reported that making the movie stopped everyday at 4 pm because Brando had to see his therapist daily, after the death of his mother.